To add User Stories to a Sprint, you must first create those User Stories and then from the BACKLOG, you can add them to an existing Sprint. Note: For details about creating User Stories, you can go to Creating a User Story from the BACKLOG or to Creating a User Story from the KANBAN chart. When you access the BACKLOG module (if available for your project), on the BACKLOG you can view all User Stories for your project that are not part of a Sprint. 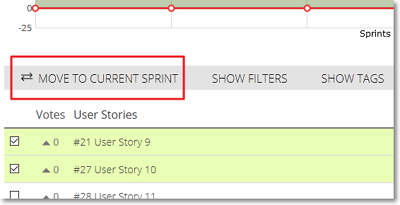 In addition, you can drag-and-drop a User Story from a Sprint to any other existing Sprint. Note: If you move a User Story that is not done (or closed) to a closed Sprint, then that Sprint is reopened.